Warn your visitors of what lies ahead with the Tinsel Beware Halloween Gate. Looming 88 in. 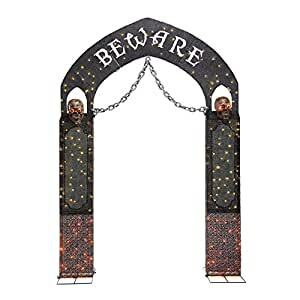 tall, this gate makes the perfect entrance to your Halloween scene or home haunt. Two skulls and a chain hanging from the top welcome guests to enter if they dare, while 240 LED lights bathe the gate in an eerie glow. Crafted with a durable metal frame and covered with tinsel, this decoration is built to last for seasons to come.